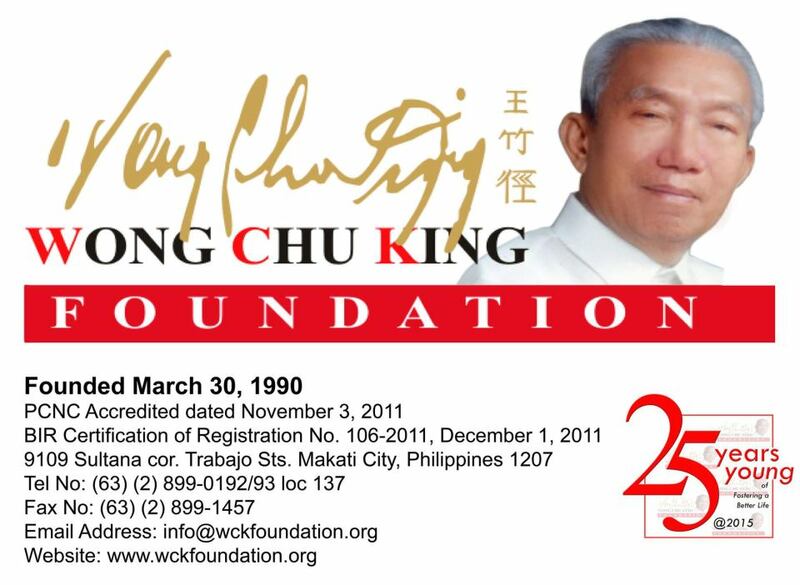 2015 Wong Chu King Foundation, Inc. Becomes FEED Patron of Education & the Environment | FEED, Inc.
15 October 2015, Manila. Today, the charitable institution of Mighty Corporation, the Wong Chu King Foundation, Inc., became a FEED Patron – committing its “full-fledged support to Education & the Environment. The Foundation is known for their good deeds towards the needy and other charitable acts, such as the rebuilding of churches in the Visayas region. PATRON (n.) One who encourages or helps a person, a cause, or a work; a furtherer; a promoter. FEED Patrons are invaluable resource persons too. They directly advance FEED’s Education & Environment vision through the impact of their professions and life callings. They are also often pioneers, prominent and recognized change agents in their respective fields of expertise, who encourage FEED’s mission in education, environment and sustainable development. Individual patrons support the Living Legacy program by donating PHP500 and up (photo 5Philippine Pesos) per indigenous wood tree planted in their name, or on behalf of other friends or family members. The marginal P500 cost per tree planted in his/her name covers the purchase of each seedling, tree guard, service and maintenance of at least 3 years (to ensure the proper growth of each tree managed by a local farmer), and the cost of each Plaque of Recognition which is handcrafted by local settlers at the tree planting sites, assigned to the plot where the tree is planted for a lifetime. Patrons also steward FEED’s “Living Legacy: Plant a Tree, FEED Our Future” Program, as Ambassadors Extraordinaire. They are advisors, partners and friends of FEED, converging our efforts towards enhancing biodiversity, restoring forests and improving research and education in the fields of agriculture, education, farming, forestry and food security. As Ambassadors Extraordinaire, FEED Patrons are individuals and organizations who also act as key spokespersons. FEED’s first patrons are former President of the Philippines HE Mr. Fidel V. Ramos & former First Lady Mrs. Amelita “Ming” Ramos. Click here for a list of the UPLB-FEED Living Legacy FOUNDING Patrons. FEED Partners with Manila Symphony Orchestra (MSO) and South Eastern College for a “Musical Tribute to Education & the Environment”, on November 25, 2015 @ the Ayala Museum (Makati Avenue cor. De La Rosa St). On Wednesday, 25 November 2015, the MSO will perform at the FEED organized fundraiser & benefit concert: “Ophie & Friends Sing: A Musical Tribute to Education & the Environment”, at the Ayala Museum from 6-9pm. Target fundraising of PHP1mln or more for FEED’s Living Legacy programs by engaging organizations and individuals with an authentic and active desire to further Social Responsibility support in whatever way they can. Highlight the stories, successes and challenges of working in sustainable development, education & environment in partnership and collaboration with other community partners. Ultimately, FEED aspires to organize this fundraising event annually by nurturing more active and strengthened relations and partnership in various segments of society, to cultivate and inspire more leadership and action through inviting captains of their respective industries who are active proponents of education & environment initiatives. It is our hope to inspire more environmental leaders in various professional fields. The Ayala Museum has graciously offered their venue in kind. Click here for the Musical Tribute Program: “Program – Musical Tribute to Education and the Environment (25 Nov 2015)“. Or contact: Anne-Marie F.M. Bakker, VP Operations at info@feed.org.ph, mobile: +63 (0)917 552 4722).